CES is always an interesting time for tech and the events themselves can get out-of-hand in some scenarios, usually because people are trying to attract more attention to themselves or their products. This is exactly what happened with T-Mobile CEO John Legere as he crashed an AT&T event and was eventually removed from the area by security. Legere, who is far from a traditional CEO (even in the tech world), showed up at the AT&T Developer Summit, which was mainly a party featuring music from Macklemore. Based upon the tweets that went around from journalists at the Developer Summit, Legere showed up to socialize with people from the tech media. 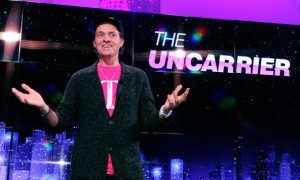 His appearance seemed harmless but because T-Mobile and AT&T are sworn enemies in the cell carrier industry, AT&T was likely unhappy with Legere’s decision to stop by and draw attention away from the event. So, security eventually removed Legere from the Developer Summit, with AT&T stating that he had been “harassing” people at the party. By no means was the appearance from Legere anything more than a publicity stunt (since tech publications are now talking about the incident), so AT&T removing him from the party simply made things better for Legere. It was likely a bad move by AT&T to actually kick him out of the party, as it is highly unlikely that he was actually “harassing” anyone there. Although allowing him to sit around and talk with journalists would have been quite hilarious as well, creating a no-win situation for AT&T. T-Mobile will be using CES to unveil its new UnCarrier 4 business strategy which will once again target AT&T’s customer base, based upon earlier tweets from CEO John Legere. Summary: T-Mobile CEO John Legere “crashed” an AT&T event at CES by showing up and talking with journalists. Eventually, security at the party removed Legere from the area, with AT&T claiming that he was “harassing” people.